In early May, I (Erin) visited a number of growers around Breeza. When I got to Warrick & Gary Moore’s property near Werris Creek I noticed something different about his tractor/planter set-up. From the tractor’s exhaust there were pipes that ran back behind the cab and then down to and across the front of his planter. I asked more about it and this is where the below information has stemmed. Below are a few questions I asked Warrick and his responses are included below. What is Emissions Technology and how did you come to try it? It is essentially using exhaust power to drive crop growth. The computer monitored system captures the tractor’s exhaust fumes & pipes it through a condenser to cool the gas before it is then pumped back through the airseeder & into the ground delivered with the seed. The gases stimulate microbes to release phosphorous & other base minerals locked in the soil making them available to the plant, resulting in plants developing a bigger, stronger root system. The gas encourages microbe & fungal growth in the soil which in turn boosts root development. Plants grown with traditional fertilizer applications don’t photosynthesise energy as efficiently from the sun, but this system encourages photosynthesis on a natural scale & plants grow more healthily, without the need to apply artificial fertilizers & still maintaining very similar to better yields has been very pleasing indeed. 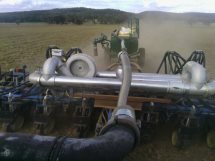 How many other growers are utilising this new technology in Australia/east Coast? There are about 20 systems working in NSW, most of which are in south of the state and around the Forbes, Parkes area. There are just 4 systems in the north 2 around Inverell, ours and now our neighbours have just got going for winter plant. What benefits do you see arising from it? Sowing on imputes while maintaining the same crop yield. With the most notable being softer country, good test weights on grain, low screenings and better on the hip pocket. 2013 Trial Block – 3 blocks planted at the same rate to compare traditional fertilizer only, versus a combination of both versus diesel emissions only. 2013 was a very dry season, but still there were obvious differences in the trail blocks. Emissions only had the best test weight & noticeably fewer small seeds. It was recommended that we go ‘cold turkey’ on the fertiliser and only use emissions. I have posted the results below, but interestingly the best yields were produced from the emissions only trial block. 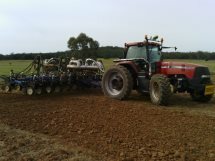 Warrick estimated that the initial cost of the set-up was between $50 000 – $60 000, depending on the tractor/implement and can be set-up on any machine tillage, summer, winter, row crop or broadacre. I was fascinated by this new technology and at the moment it is only really being broadcast through field days and the internet. Warrick did hold a number of field days at his property last year outlining what he was doing and looking to achieve. Ideally, eliminating the need for fertiliser and producing high yielding and better quality grain is the goal. We have included a number of photos showing the set-up at Warrick’s farm. For anyone interested in pursuing this further, please contact the AgVantage office. We will be more than happy to look at hosting a field day/demonstration of this in operation or point you in the direction of someone that can provide you with more information.